There are a handful of device that our readers absolutely love, so we try to cover them each and every time they go on sale. 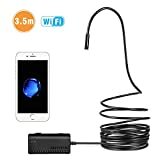 Up near the very top of the list is the Depstech WiFi Borescope Inspection Camera. Tens of thousands of our readers have bought this awesome little camera, which connects wirelessly to your iPhone or Android and lets your phone see where no other smartphone can. Now, for Prime Day 2018, this awesome accessory has dropped to a new all-time low of just $28.79. Just clip the 20% coupon on the product page to snag this awesome camera at its best price. Trust us, this is a deal you don’t want to miss!